Psalm 73:23-28 Nevertheless, I am continually with you; you hold my right hand. You guide me with your counsel, and afterward you will receive me to glory. Whom have I in heaven but you? And there is nothing on earth that I desire besides you. My flesh and my heart may fail, but God is the strength of my heart and my portion forever. For behold, those who are far from you shall perish; you put an end to everyone who is unfaithful to you. But for me it is good to be near God; I have made the Lord GOD my refuge, that I may tell of all your works. I have found in all of these years of following Jesus that the Word of God clearly and precisely touches the reality of who I am. Sometimes it really hurts to recognize that the Holy Spirit is using the divine revelation of God in the Bible to address the most personal of issues that affect my life. So it is with Psalm 73. I have one of those love/hate relationships with it. I love the way it ends. I don’t like the way it convicts me in the beginning. You see, this Psalm describes me. I tend to make comparisons. And like Asaph, the author of this Psalm, those comparisons are distorted. I think we can all relate to this. We tend to see what we want to see because our hearts are already convinced that there is something better that we are missing. When our minds have determined that we are not experiencing everything we could, then we tend to be extra-observant of those things we think we are missing. For example, when you wanted to buy a different car, and you had to choose a model and a color, you started noticing how many other cars just like it there were on the road, didn’t you? There were no more of those cars on the road today then yesterday, but suddenly you noticed more of them because it’s what you wanted. Asaph is not happy about his financial condition and social status. He thinks he would be better off if he had more money. Suddenly it looks like everyone who doesn’t trust God has what he wants. His impressions of the ungodly person become so distorted that in addition to being wealthy he thinks they also have no struggles. Their bodies are healthy and strong. They are free from the burdens common to man. They appear to not be plagued by human ills. All he can see in the unsaved person is what appears to be great prosperity in every part of their lives. This is a huge distortion of reality, isn’t it? But when we play the comparison game we invite the Enemy to deceive us into thinking that we are missing something and only the world can provide it. We are tempted to pursue their independent and self-sufficient lifestyle, being carefree and increasing in wealth. But Asaph quickly comes to his senses. He passes on the opportunities of the immediate and with a mature perspective he considers the long-term ramifications of his choices. The immediate benefits of worldly living are not worth the ultimate destruction that will come upon all who choose them. Satan has devised an attractive “70 years same as cash” offer. He has sold people a bill of goods. His advertisements are convincing. People believe that personal happiness is the ultimate experience of life, and that the world’s ways are the best ways to achieve that happiness. And you don’t have to pay a thing now to enjoy all of the benefits. Just sign this contract and take the merchandise home today. You can pay for it in 70 years. Asaph doesn’t fall for it. He’s tempted, but when he takes the offer to God (verse 17) his eyes are opened to be able to read the fine print. He sees that in exchange for immediate pleasure and prosperity we sacrifice eternal life. Payment in full is required upon your death. Payment consists of the total loss of life, wealth, health, relationships, and freedom and an eternity of suffering separated from God in the lake of burning sulfur. The choice seems easy. It’s either the world now and nothing later, or God now and everything later. Those who choose the world now may get the world’s goods now, but they get God never. Those who choose God now may have to suffer for a while, but God is there to walk through it with them, and God will bring them into His glory when it’s over. Psalm 72:18-19 Blessed be the LORD, the God of Israel, who alone does wondrous things. Blessed be his glorious name forever; may the whole earth be filled with his glory! Amen and Amen! As King David neared the end of his life he decided to write a prayer for his son Solomon who would succeed him on the throne of Israel. We have that prayer recorded in the Seventy-Second Psalm. As he prays for his son to be a man of justice and righteousness, he recognizes that the distinguishing characteristic of a great leader is compassion. Three separate times in this prayer David refers to the recognition of the needy, the defense of the poor, and the deliverance of the oppressed. Then something happens. King David is transported in his spirit from his prayer for his son to a recognition of God’s son as the true King. Suddenly, in words that cannot apply to the historical reign of Solomon, David speaks prophetically about the coming King of Kings. It is at the conclusion of those prophetic words that David writes – Blessed be the LORD, the God of Israel, who alone does wondrous things. Blessed be his glorious name forever; may the whole earth be filled with his glory! Amen and Amen! Recently I had an experience that was similar, although not nearly at the same level of Divine revelation. Last Tuesday my wife and I stood in the midst of the ancient Mayan city of Tulum on the shores of the Caribbean Sea. I was thrilled. I love places like this and could spend hours exploring them. As we listened to our tour guide, and expert in Mayan history, he began to inform us about the various gods of the Mayans that were depicted in the carvings on their temples. He talked about only a few of the 136 gods that they worshipped, like the rain god and the sun god and the bee god. 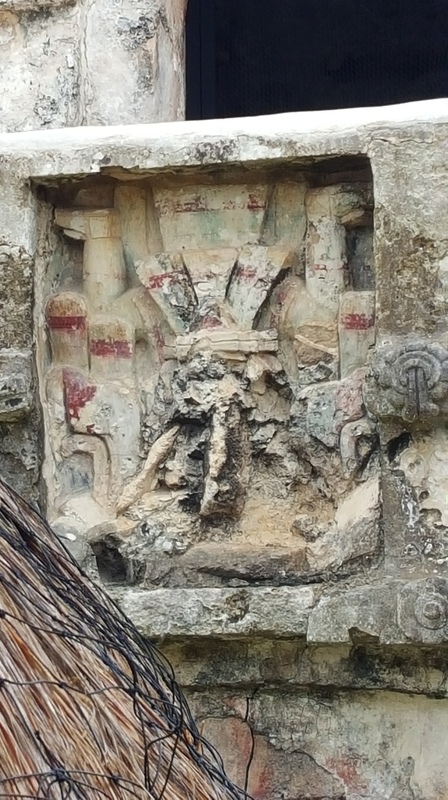 Then he pointed to a carving on the corner of one of the temples. It was carved in such a way that when seen from the side it formed a profile of the god, and when seen from the front it formed a full face. Hopefully you can see that in the images below. As the guide explained to us that this god was carved into all four corners of this temple, he stated that this was the creator god, the supreme god over all the other gods. Up to this point my mind was totally concentrating only on the earthly historical aspects of the Mayan people. But then the guide pointed to another carving of a god. He is called the descending god, and is carved with his head downward and his legs upward. In the first picture you can see the head and a leg, and in the second you can see the legs more clearly. He is seated upside down on a throne, and is always at the top of the temple. Immediately my mind was transported from the historical civilization to the historical Christ. Did this ancient civilization have an understanding of God that included God himself coming to earth? I began to study the gods of the Mayan culture, and there is, according to one source, no evidence that the descending god represents Christ. And yet, even in all the false religions of the world, there is an understanding that God is somehow involved personally in the affairs of man. For the rest of the tour I could not stop praising God that I know the truth that He did descend from glory in the person of Jesus Christ to save the world from its sin. I praise God that there are no other gods, and that He alone is the Creator of all things. I praise God that His glory fills the earth to such a degree that even in the false religions of the world He can be seen. I praise God that Jesus Christ sits on the throne of heaven and rules all things, and he does so with a heart of compassion, love, righteousness, and justice. What started out as simply an historical adventure turned into a deeply significant spiritual moment for me. I was set up. The surprise birthday party for a grandson on Saturday turned into an amazing surprise as my daughter and her family from Sun Prairie had driven up to turn the party into a family celebration of our 40th wedding anniversary. We sat around the pool at their hotel and watched the 10 grandchildren frolic in the foam of the hot tub and splash their way from one end of the pool to the other. We had pizza and cake and presents. When we went to bed that night my wife and I were overwhelmed with the blessings of family. We rested well. What we had just received from our kids was sufficient. When the worship service started on Sunday morning it was revealed – totally to our surprise – that there would be a 40th wedding anniversary reception after church as a part of our regularly scheduled CRAVE meal. The worship center was transformed almost instantaneously after the service into a banquet hall. The grandkids moaned and giggled as Grandma and Grandpa responded to the clinking of glasses with kissing. As we ate, Denise and I were honored by our children with a video that commemorated our lives and our love. Included in the video were interviews with the grandchildren. The answers they gave to multiple questions asked about Denise and me revealed the depth of our family love. You see, only in a relationship of trust based on love can grandchildren confess that the most significant result of Grandpa’s forty years of marriage is that he is old and bald. Even though I am old and what hair I have left is gray, my God has not forsaken me, nor will he, so that I may proclaim to the next generation the might and the power of God. I am so glad that a child’s definition of old does not affect God’s power for service.